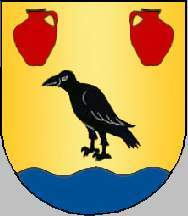 Shield Or with base wavy Azure, a raven Sable, in chief two pitchers Gules set in fess. Mural crown Argent with three visible towers (village rank) and white scroll with inscription in black capitals "AREIAS - BARCELOS". Areias Commune is one of the 61 communes of Barcelos Municipality; it had 1014 inhabitants in 2011 and covers 2.5 km².